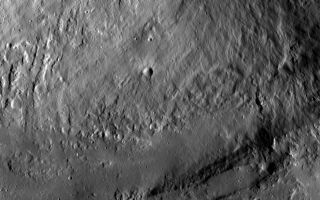 This stunning space wallpaper from NASA's Dawn spacecraft shows an interior wall and southern terrace of Marcia crater on Vesta. Relatively smooth material covers much of the terrace and has flowed downslope (toward the top of the image) through channels. This material was likely melted during the impact from a space rock onto the surface of Vesta that formed Marcia crater. The impact appears to have occurred at a high velocity. This image was obtained by Dawn's framing camera image on Jan. 5, 2012.